What is Enlighten Teeth Whitening? Enlighten Evolution teeth whitening is the only teeth whitening system in the world which guarantees VITA shade B1 (the Vita scale being the shade guide used by dentists all over the world) on every patient’s case, no matter what the teeth shade was when the treatment started. The Evolution Complete Kit for both in-office and take home teeth whitening treatments, contain 6% hydrogen peroxide in compliance with the EU legislation that states in-surgery teeth whitening should not use peroxide concentrations over 6% – making the entire teeth whitening treatment completely safe, as well as effective. How Does the Enlighten Evolution System Work? The Enlighten Evolution teeth whitening system available for our Wootton Basset and Swindon patients works with the use of custom-made trays that comfortably fit over the patient’s teeth; the trays are created so that they have a tight fit over the teeth until the point where they meet the gums – creating a form of seal. 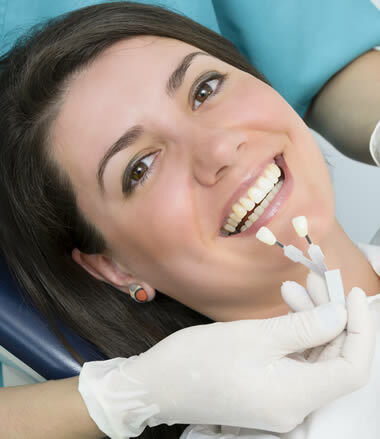 The low-peroxide concentration teeth whitening gel is applied to the tray, and is then placed over the teeth. This treatment is repeated over a period of 14 nights, The Enlighten Evolution system’s hydrogen peroxide concentration of 6% allows it to whiten teeth dramatically in the safest manner possible, with close to zero sensitivity experienced by patients in every case. The tight seals created by the custom-made dental trays also help in increasing the permeability of the teeth to oxygen to break down the stains on the teeth surfaces. The teeth whitening procedure is successfully carried out with no need for gingival protection, no special lights, and no dehydration whitening. Enlighten Evolution 3 has the distinction of being the only teeth whitening system in the world which guarantees a result of shade B1 on the Vita scale – the shade guide used by dentists worldwide. The whitest shade possible is guaranteed regardless of the shade of the teeth before treatment starts. The 6% hydrogen peroxide concentration on the whitening gels makes the products safe and fully compliant with EU legislation, which states that teeth whitening in-office should not involve products containing more than 6% hydrogen peroxide. Almost zero sensitivity is experienced by patients in most cases. There is no need for gingival protection – the gums and soft tissues will remain safe throughout the entire teeth whitening treatment. Evolution Complete Kit (for Home and Office) – this complete teeth whitening treatment kit is available in sets for three or six patients, and includes: both the take home whitening kits, and with lab work. The fully-integrated system has everything needed to successfully complete the teeth whitening treatment, such as: home and office whitening gels, impression materials and trays, desensitisers, whitening toothpaste, tooth serum, and sealed/locked lab work for three patients.